In first person shooter Robot Roller-Derby Disco Dodgeball* (RRDDD) players sling dodgeballs at each other instead of bullets. ·Robot Roller Derby Disco Dodgeball’s gorgeous neon and electronica-fueled visuals mask a surprisingly intense challenge. When you finally grasp the unique movement system, or wallop an opponent from across the room with a calculated throw, the satisfaction is palpable. Beneath the silly moustaches and customizable eyebrows is a deep yet non-violent shooter that relies on precision and exact timing. ·Outside of a few exceptions, fast-yet-strategic FPS gameplay has largely disappeared since the days of Quake and Unreal Tournament. This makes Robot Roller-Derby Disco Dodgeball a fantastic option/alternative for fans of old-school shooters. ·The soundtrack is INCREDIBLE. Seriously, just listen to it. ·The game features a multitude of modes and maps, giving it a HUGE amount of replay value. You can battle an opposing team around a series of neon pillars one match, and play a game of pseudo-basketball in a discotheque the next. RRDDD even features a randomized “Arcade” campaign where you fight to earn superpowers and become the President of the Galaxy. 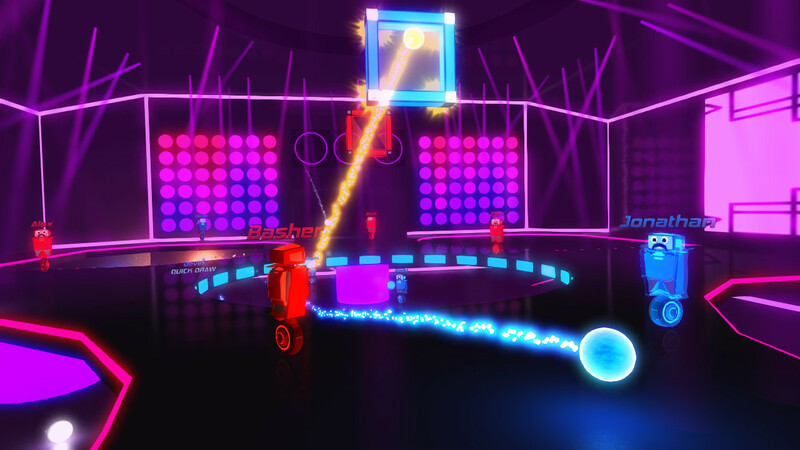 ·In a gaming environment filled with gritty, “mature” shooters, a bright sense of humor and style makes Robot Roller-Derby Disco Dodgeball a refreshing change of pace. ·One “Trickshot” worth 500 points is called “Godlike.” You earn this by catching an opponent’s ball in mid-air and using it to destroy another enemy before touching the ground. This entry was posted in Uncategorized and tagged alternative, Bible, christian, christian gaming, christian review, christianity, family-friendly, FPS, gaming, God, indie, Jesus, KJV, PC, quake, review, Robot Roller-Derby Disco Dodgeball, RRDDD, salvation, shooter, Steam, video game, video games, video games and the Bible, Video Games and the Bible Highlights, Video Games and the Bible Reviews. Bookmark the permalink.